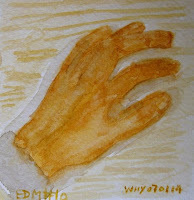 I painted it with watercolor directly , but it looks awful. 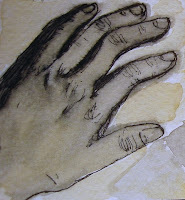 Then I draw it with a pen, and add watercolor later, but the ink blend with the watercolor and the color looks terrible, and the hand looks like a zombie’s hand. Then I tried it again on my half- finished Moleskine page, it still looks odd but its the best of three already. So I added the color and call it a day. Hand is too hard to draw or paint. I agree, hands are tough, but it looks like you got it with the last one!